Meet your teacher… Watch Michelle’s feature for Activia and The Irish Times on living InSync. Michelle is senior yoga teacher, certified Health and Wellness Coach and runs her own successful retreat centre, the Cliffs of Moher Retreat on the West Coast of Ireland. She is passionate about helping people to take ownership of their complete health; body, mind and higher self. She believes that the path to wellness is an holistic one, with equal focus on movement, diet, positive thinking and connection to nature. Through her popular and inspiring retreats which include meditation, a variety of yoga classes, a carefully planned schedule and organic vegetarian and vegan food, her guests experience first hand the many benefits of this lifestyle. Her passion is yoga, and her classes are themed to provoke questioning and contemplation for her students. She weaves philosophy with humour and advanced knowledge of anatomy and creates and holds a space for deep healing. She dons her Health Coaching hat in her role as retreat manager and has created a range of programs, offering a variety of experiences to inspire and educate. She is passionate about healthy eating and offers vegetarian cookery demonstrations at her retreat and is highly involved in the menu planning for which the retreat is gaining notoriety. 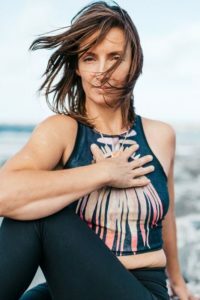 Michelle inspires people through experiences to find their own truth and provides the support for people to take control of their own wellness. She is a Mum of 3 boys and a keen snow-boarder. She swims in the cold Atlantic ocean every morning with her friends, has a daily yoga practice, loves to dance, is a plant-based eater and keen student of all things health related.